A caiman is a medium to large carnivorous reptile belonging to the subfamily of Caimaninae, and the family of Alligatoridae, the same family that alligators come from. 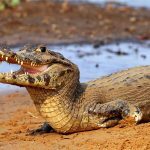 Usually of a smaller size than crocodiles and alligators, it is included in the Crocodilian order along with the latter two. They are found in both freshwater and saltwater habitats, in various lakes, marshes, and mangrove rivers in Central and South America. 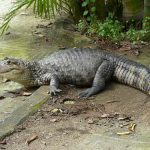 They are generally counted among the smaller crocodilians, growing about 5 to 9 feet on average, though it does vary from one species to another. The black caiman is one of the biggest surviving members of the Alligatoridae family, being over 16 feet long from snout to tail, and weighing around 2,500 lbs, which is almost the same as some large crocodiles. Their diet primarily comprises of fish, while they also often hunt birds, small reptiles, amphibians like frogs and turtles, as well as rodents and other small mammals. Like the others in the crocodile family, caimans have keen eyesight and a good sense of smell. They also share similar hunting habits where they remain hidden underwater, keeping only the eyes and snout over the surface, waiting for some animal to come near enough for them to pounce. Males are known to be quite territorial. Being cold-blooded semiaquatic animals, caimans are often seen basking along riverbanks. Black caimans even venture to land at night to hunt. 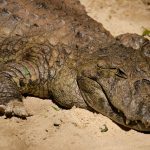 Some species, like the spectacled caiman, prefer to remain in water so much that they often make burrows in the mud and go into an inactive state during dry seasons and droughts. The mating season varies depending on species, after which the females build nesting mounds with a deep hole for laying eggs. Thirty to sixty eggs are laid that take about 3 months to hatch. They can live between 20 and 40 years on average, with the longest recorded lifespan in the wild being 60 years. Being the apex predator in its ecosystem, it does not have many predators, but jaguars and large snakes do hunt them at times. Humans are a huge threat to their population, hunting them for their meat and skin. Caiman skin is used for making leather shoes and other items. In fact, they are protected by law in many places to keep them from becoming endangered.